We are raising money for a statue of William Marshal in Pembroke. Celebrated in his own time as tournament champion, warrior, adviser to 4 kings, he was central to negotiations that led to Magna Carta.. He became Regent of England following the death of King John, saved England from a French invasion and reissued Magna Carta under his own seal. He was also Earl of Pembroke on his marriage to Isobel de Clare and carried out extensive improvements to Pembroke Castle which he rebuilt in stone. The money will be spent on the design and construction of the statue by artist Harriet Addyman. This will involve modelling the full size statue, then casting in bronze. The statue will enhance the town, promote Pembroke's great history and attract visitors. The Pembroke & Monkton Local History Society, in partnership with Pembroke Town Council, believes that it is by looking to our great heritage that we can regenerate this historically important town of Pembroke. 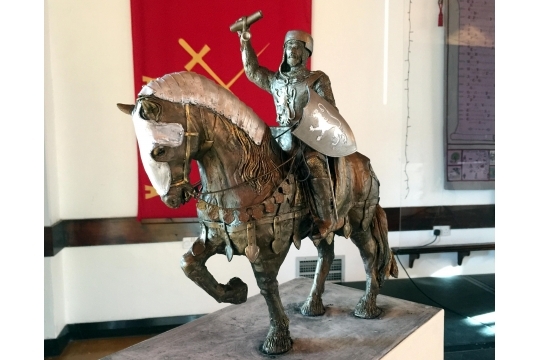 At a public meeting on February 2nd in Pembroke Town Hall to launch the maquette of the William Marshal statue we raised £303 in donations to begin the fundraising appeal.